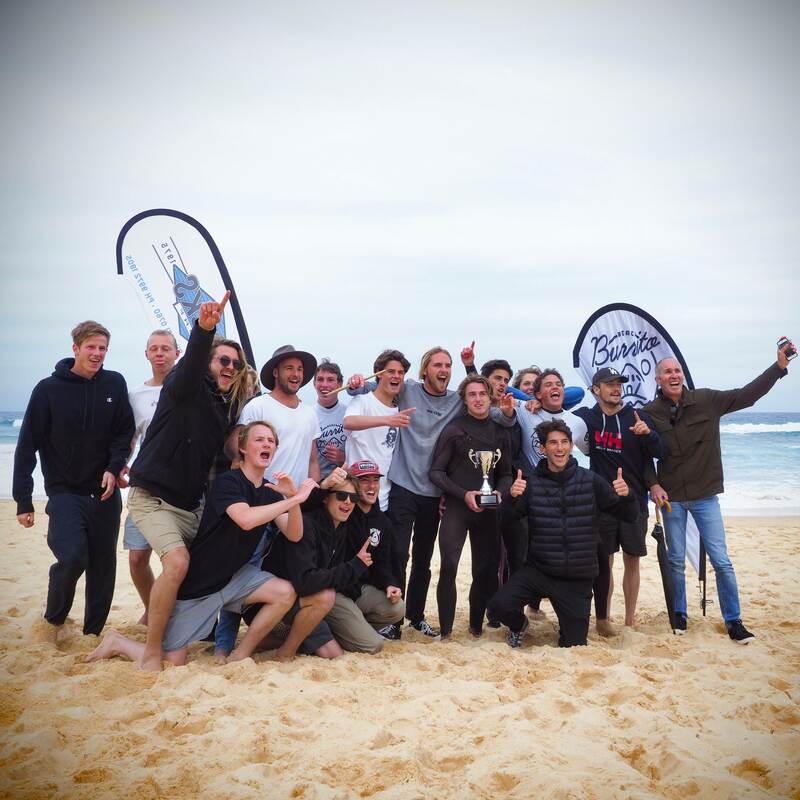 Curl Curl Boardriders have used local knowledge and smart wave selection to win the Beach Burrito Northern Beaches Gromtag Qualifier at South Curl Curl Beach. With the event being postponed due to unsuitable conditions the week before at Dee Why Beach, the Curl Curl locals made the most of the event being held on their home turf winning the final by ten points. Held in blustery onshore conditions with an increasing swell, the Curl Curl team of Sam Howell (9.30), Ben Walsh (13.03), Ed Aubrey (10.87), Carter Harris (10.73) and Josh Withers (6.70) finished with a total of 54.63. The Central Coast’s North Shelly Boardriders (43.83) finished runners-up ahead of North Avalon (39.50) in third and Long Reef (34.77) fourth. Curl Curl’s Ben Walsh and Ed Aubrey made the most of the tricky conditions in the 50-minute final surfing with plenty of power and commitment. Team Captain Aubrey is now looking forward to the opportunity of surfing for an Australian Title, “It’s so awesome to have a big support crew on the beach cheering for the team”, Aubrey said. “We had our team manager Perko on the drums all day revving up the boys and we will have an even bigger support crew for the Aussies in a month’s time, hopefully we become the first Under 18 Champs of Australia”. The Curl Curl team used their local knowledge when it counted most finding the best waves that offered scoring potential. North Shelly, North Avalon and Long Reef found themselves lost at sea for most of the decider with all three teams running out of time and only giving their fifth surfer a few minutes each to find two scoring rides. North Avalon’s Jasper Giddy won a pair of Bose Headphones for posting the highest score in the final – 13.50 with the stylish natural footer executing some big closeout snaps. With the top four teams advancing to the Australian Championships, North Narrabeen, Mona Vale, Queenscliff & Dee Why will be on the reserve list after being eliminated in the Semi Finals. The 2018 Gromtag Australian Series is proudly supported by Beach Burrito Company, Perfect Wave Surf Experience, Triple Bull Surf Cronulla, Joistik Surfboards, Bose, Wicks Surf and Swellnet. Whats Australian about it? Judging by teams/locations, its just for NSW?